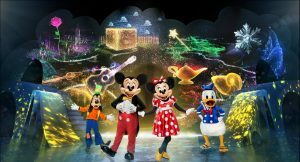 Disney on Ice is returning to Orlando at the Amway Center on Friday, September 7th through Sunday, September 9th, 2018 with Disney’s newest show “Mickey’s Search Party”. Joined by Mickey Mouse and Minnie Mouse, live hosts will enliven the performance space by welcoming everyone into the magical world of Disney On Ice, setting the stage for a participatory adventure. Guests will embark on a search for clues to find Tinker Bell after Captain Hook tries to capture her magic. As each scene unfolds, compelling storytelling will be delivered through multi-level production numbers by skaters, performers and acrobats. As Miguel from Disney’s “Coco” crosses the Marigold Bridge, he finds himself in the magnificent spirit realm painted with vibrant color, with skeletons atop sway poles oscillating back and forth over the audience in this culturally rich heritage celebration. Through video projection, Arendelle builds from the ground up, and ice harvesters from Disney’s “Frozen,” use extreme skating to launch themselves from the mountainous, wintry slopes delivering an athletically-driven performance as they chop their way through blocks of ice. The iconic chandelier seen in “Be Our Guest” comes to life as Belle and the enchanted objects from “Beauty and the Beast” become a rotating carousel using aerial silks and lift upward into the air, mesmerizing onlookers seated above and below. Read reviews of past Disney on Ice shows by Orlando Local Guide. Friday, September 7th at 7:30 p.m.
Saturday, September 8th at 11:00 a.m., 3:00 p.m. and 7:00 p.m.
Sunday, September 9th at 1:00 p.m. and 5:00 p.m.
Tickets are available at DisneyOnIce.com or at the Amway Center box office (phone for information only: 407-440-7900). For group ticket sales and information, call 866-248-8740. This entry was posted in Family and tagged activities, amway center, annual events, disney world, labor day, orlando, september, shows. Bookmark the permalink.